Resource Editor for Windows EXE and DLL Files: Resource Tuner. Resource Tuner is the best resource viewer that has ever existed! As a Windows software skinning and customization artist, I can edit all theme/skin binaries without any trouble. Yes, there's freeware with nearly same function, but I must confess I much prefer this stuff! Thanx! I played with your trial version for only a few minutes and I was hooked! It's even more than I was looking for and I'm happy to add it to my arsenal of tools. I hope you keep on doing active development for Resource Tuner. From the minute I loaded it on to my machine I was able to change all the info I wanted... no hours of reading manuals or help menus, just a little input and a click of the "Apply" button... I will most definitely recommend your software to friends and colleagues. Resource Tuner lets you view, extract, replace, edit, and delete the embedded resources of executable files: icons, strings, images, sounds, dialogs, menus - all that make up the visual part of your Windows programs. In fact, it allows you to add your own custom branding to an application, change dialog messages, customize toolbar actions, and so on without having access to the actual source code. Resource Tuner offers exciting possibilities even if you aren't a programmer. It's perfect for translators, tweakers, and anyone else who wants a different look and feel for an application. Resource Tuner is about the only tool you would probably trust to modify resources in a PE executable. Discover the unique features of this Resource Editor, including how to open problem executable files and edit the hidden data which the other editors simply cannot see, wide range of supported resource types, UPX unpacker, and more. You will learn the industry standard program for translating and customizing the user interface. Resource Tuner is packed with features which make it an essential tool for anyone tweaking another programs. Have fun personalizing any application to your own unique taste. With the powerful Resource Tuner, you no longer need to suffer with ugly default icons and pictures. The usage is very simple, just run the program and then select the EXE or DLL file to read the data from. Once you try it, we think you will find it hard to go back to other resource hacking utilities. from 2000 through XP, Vista, 7, 8 and 10. Longing to have a personal touch on your favorite application? No matter where it runs - whether on your PC or on your Pocket PC, on your Mobile Phone or on XBox, it is still a Windows program. What better way than with Resource Tuner, a resource editing solution you can use now. Quick and easy access to all the resources which are normally inaccessible really allows you completely customize any program you own. Disappointed by older applications using the outdated "chiseled 3D" look, rather than the new Vista look? Resource Tuner's Manifest Wizard provides a quick fix. Bring your pre-XP legacy programs back to the future, blessing it instantly with the new look. Resource Tuner makes it straightforward to translate any application, even if you do not have the source code for it, even if its original developers are long gone. Simply replace all text resources with their translated versions, and resize forms and buttons to fit the translated text as needed. No programming skills required! 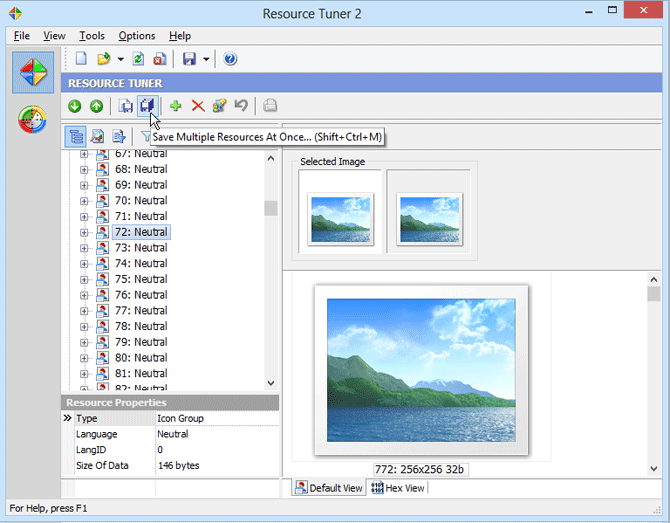 Resource Tuner is a PE Explorer spin-off product that is used solely to edit resources in Windows programs. PE Explorer is the choice for anyone looking for more. Includes a Resource Editor, Section Editor, Disassembler, Dependency Scanner and an Export/Import Viewer.